Plan your conferences and meetings at The Parlour Inn to take advantage of our central location, exceptional service, and our great atmosphere. Meetings at The Parlour Inn are a success because we collaborate with our clients to create custom events that exceed expectations. Our onsite restaurant caters to every palette, while our versatile meeting spaces accommodate all your business needs. The accommodations, amenities and surroundings make The Parlour Inn the perfect conference destination for businesses in southwestern Ontario. Our hotel is the only conference centre located in the heart of downtown Stratford that offers free parking, so your guests have the freedom to commute without worry. Create an exceptional experience for your attendees: plan a half-day meeting, or a multi-day conference in the heart of Stratford, Ontario at The Parlour Inn. The Parlour Inn has three unique spaces that are all customizable for the requirements of your corporate function. The Churchill Room comfortably seats 40-60 people. This elegant ballroom is perfect for larger conferences. St. Patrick Room boasts the perfect feel and form for a sophisticated board meeting or strategic breakout session. Similar in size, the Windsor Room also has an old-world tone, complete with stained glass windows. Both smaller rooms are suitable for up to 20 people. Our onsite restaurant will fulfill all of your catering needs. Our catering staff will create custom food orders that keep your attendees well fed and in great spirits. During your business meeting, our servers will bring your refreshments right to your table, so that you can continue to collaborate and create innovation. If you are spending the night at our hotel or meeting in the morning and enjoying the afternoon off, your attendees will thoroughly enjoy the beauty and fun in the eclectic town of Stratford. Just steps from our hotel, your guests can discover world-renowned theatre during the Stratford Theatre Festival. If you are looking for outdoor fun and fantastic culture, Stratford Ontario will amaze your entire group. At The Parlour Inn, you can create an experience that will benefit your business: Build innovation in our boardroom and strengthen colleague relationships with team-building activities. Demonstrate your appreciation for your employees by creating an exceptional guest experience that includes custom menus and versatile meeting spaces. Don’t settle for a standard business meeting. 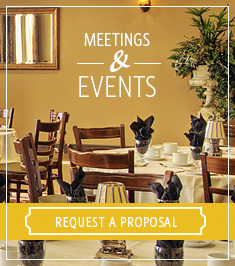 Contact us today to plan your meeting or conference at The Parlour Inn in Stratford, Ontario.